There are billions — possibly trillions — of galaxies in the visible universe. But why are there any galaxies at all? Their existence seems to depend not merely on elegant mathematical and physical formulas but on a handful of seemingly arbitrary constants, ranging from the basic mass of an electron to the “cosmological constant” that regulates the universe’s rate of expansion. Change one of those, and the universe would lack the ability to form molecules, to say nothing of galaxies. In their 2016 book A Fortunate Universe: Life in a Finely Tuned Cosmos, University of Sydney astronomers Geraint Lewis and Luke Barnes offer a creative overview and lively debate on the fast-evolving understanding of what scientists call fine-tuning: the factors in a system that, if altered even slightly, would result in vastly different outcomes (for instance, a sterile universe populated only by solitary primordial protons). The book, published by Cambridge University Press and well-received by physicists, philosophers, and reviewers, represents just one facet of the John Templeton Foundation’s ongoing partnership with Barnes — a partnership that combines new research on galaxy formation with outreach to scientists, philosophers, and the interested public who are fascinated by the increasingly well-studied phenomena of fine-tuning. Working with a network of colleagues and a sprawling network of computers, Barnes runs large-scale simulations to better understand the ways that galaxies form. By simulating “counterfactual universes” where the fundamental constants and laws of physics are slightly different, Barnes and his colleagues are getting a better sense of just how probable or improbable the world as we know it may be. Sometimes the answers come with a surprising twist: Barnes and his colleagues’ data show that galaxy formation seems to be surprisingly insensitive to high levels of vacuum energy. “We’re finding that galaxies are more robust than we thought,” Barnes wrote recently in Nautilus magazine. If galaxies form in a greater range of conditions, it could be an argument against fine tuning — except for one thing. 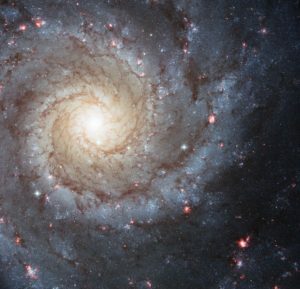 If the only situation in which galaxies, stars, planets, and (ultimately) intelligent observers could exist was one, exceedingly improbable, level of vacuum energy, then it would follow that that’s the only scenario in which an observer could exist to make the observation — a kind of cosmic Catch-22 known as the weak anthropic principle. But as it turns out, the observed levels of vacuum energy in our cosmic neighborhood are far lower than the expected average. If galaxies can form in a vast range of more-normal scenarios, our outlier galaxy turns out to be another kind of exceptional improbability — causing the question of fine-tuning to pop up again. Barnes frequently speaks publicly about the current state of thought about fine-tuning among physicists, cosmologists, and astronomers. He’s noticed that the topic spurs a very different type of audience response than scientific presentations usually garner. “No matter what the audience, you always get questions,” he says. In A Fortunate Universe, Barnes and his co-author Lewis explore some of those opinions, including their own quite different instincts and views. If, at the end, readers find themselves wanting to raise their own hand, whether to ask a question or offer a potential solution, that is a sign of just how big the questions are that fine-tuning raises — and how exciting is the current search for answers.